Ditch the time restrictions and head out freely to visit the premier tourist places of Agra with your friendly travel companion Indiator. Experience a round trip train journey to Agra with Indian Railway’s super fast train. Agra city is carved out of several historic events under the rule of Mughals in the past. Hence, it has monuments reflecting the presence of Mughal in every corner. The highlight is visit to one of the seven wonders ‘Taj Mahal’ built by Mughal Emperor Shah Jahan posthumously dedicated to his wife Mumtaz Mahal. The three places we will visit are – the Taj Mahal, Agra Fort & Mehtaab Bagh. Go through the intricate carvings on the walls and latticework. Ramble on the gardens facing Taj Mahal divided by a canal with fountains. Astonishingly complex and stunning calligraphy of Arabic poems on the walls. 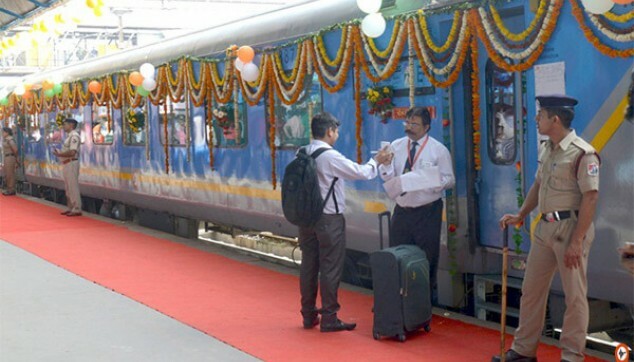 You would be picked up from your hotel in Delhi and transferred to Nizamuddin Railway Station to board super fast train ‘Gatiman Express’ to Agra. It will depart from Delhi at 08:10 am and reach Agra at 09:50 am. 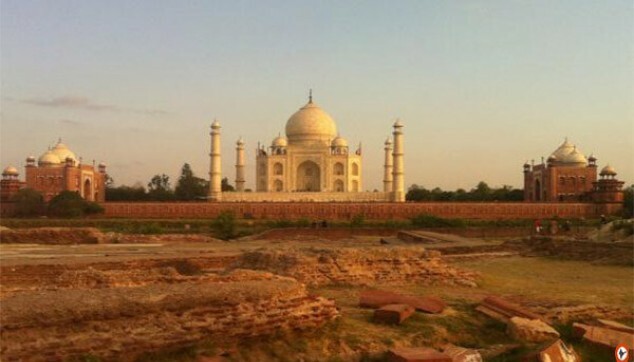 On arrival in Agra, you will be led by our representative in an air-conditioned car undertaking the daylong tour. A proficient tour guide will also accompany you to provide complete information about places. We will undertake our tour by visiting one of the Seven Wonders of the World ‘the Taj Mahal’. It is an epitome of architectural mausoleum and symbol of love built by Mughal Emperor Shah Jahan in memory of his wife Mumtaz Mahal. The grandeur is situated on the banks of river Yamuna flowing at its back side and sprawling manicured gardens divided by canal with fountains in the front. It is made up of white marble adorned heavily with motifs, incised paintings, floral carvings, latticework, colorful designs on floor and ceilings. The four minarets enhance its beauty standing tall parallel in front and back. Watching the impeccable embellishments and architecture you will realize its certainty as a wonder. Then, take a walk of joy in the Mughal styled garden overlooking it with fountains and manicured trees and flowers. Fulfill your dream of witnessing the marvel and take home lots of pictures at Taj Mahal treasuring the memory forever. Our next visit will be to Agra Fort located at a distance of 2.5 kms from the Taj Mahal. Its foundation was laid by Mughal emperor Akbar and the construction was continued intermittently by its descendants. The monument can be best described as walled city. It spreads in a triangular area for about 94 acres with walls standing 70 feet high in semi-circular shape. The fortification is made of red sandstone lending it red color due to which it is also called ‘Red Sandstone Fortress’. It is listed as UNESCO World Heritage site. You will notice how minute detailing is given importance in the making. Click pictures of the grand beauty keeping memories alive. You will be taken for lunch in a local restaurant where you can relish the food of your choice. After that browse some shops in the nearby and pick some souvenirs for your family and friends back home. We will leave for another splendid creation by Mughals called Mehtab Bagh. 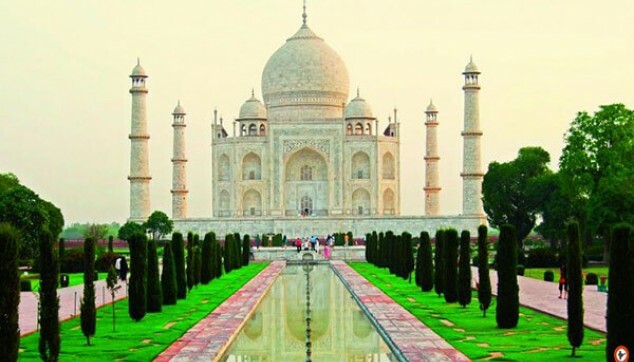 It is a garden built across Yamuna River perfectly aligned with Taj Mahal. The inexplicably gorgeous gardens are scattered in square shape measuring about 300 by 300 metres (980 ft × 980 ft). Enjoy the sunset and soak in the moment leaving an everlasting impression on your mind. You will be dropped safely by our driver at the railway station to board the train ‘Gatimaan Express’ for Delhi. The train will depart from Agra at 05:50 pm and arrive in New Delhi at 07:30 pm. Our driver will pick you up from the railway station in Delhi and drop you the hotel or airport.